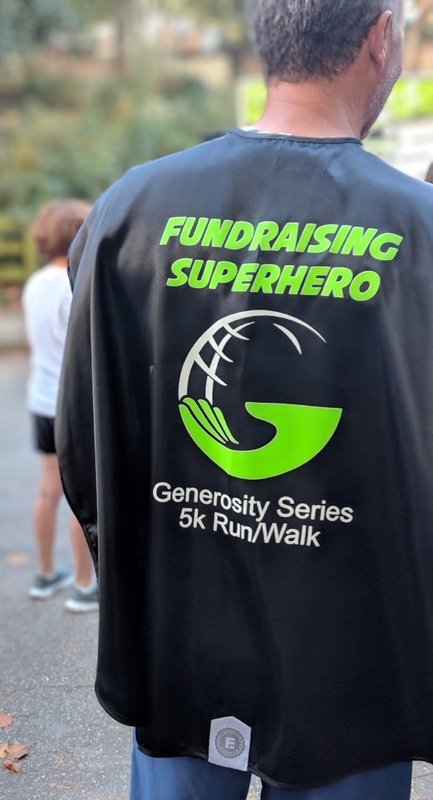 Feet thumped in Chastain Park under the sunny sky this past Sunday morning as FCS joined the Generosity Series’ at their first Generosity Atlanta multi-charity 5K run. Bright and early at 8:30 a.m., seventeen runners took off to represent FCS. The runners included a mix of FCS staff, neighbors, and supporters. The day brought new meaning to the idea of laboring alongside each each other! Between donations and prizes, our team raised $9,070 for our work. We cannot thank the runners - and people who supported them - enough! Adam Panell won the “Fundraising Superhero” cape for being the event’s top fundraiser. Director of The Lupton Center Shawn Duncan came in second overall in the race, while FCS Executive Director Katie Delp placed first in her division. The event featured a “Wheel of Generosity” where participating charities could win additional prizes. FCS won $400 during two “Wheel of Generosity” spins! Bonus! Overall, we felt so grateful for everyone who supported us and our neighborhood as we ran together for South Atlanta. Even Jim Wehner ran with us all the way from Minneapolis! Thanks to our sponsors, and again to our runners on the Running with Purpose team -- everyone from Mazie Lynn, Donnell Woodson and his family, to Barrett Smith’s dog Tulip, who was the first four-legged participant to cross the finish line. We’re thankful, delighted, and sometimes sweaty as we go far together at FCS. Thank you! If you still want to give to our team or want to support a runner, you can donate to our team for the next two weeks! Click here or the donate button below to give! What physical activities have helped you feel connected to your community? The possibilities are endless! We’d love to hear your thoughts and comments below.